Silvia González, Department of Spanish and Portuguese Languages, KUIS, Kanda University of International Studies. González, S., & Nagao, K. (2018). Collaborative learning through Japanese-Spanish teletandem. Studies in Self-Access Learning Journal, 9(2), 196-216. In 2017, for the first time, we organized 16 sessions of teletandem for learners of Spanish and Japanese. The participants were students of Spanish language at KUIS (Kanda University of International Studies) and students of Japanese in UNAM (National Autonomous University of Mexico). For KUIS, it was part of the course titled Special Studies on Mexico I and II. As for the Mexican side, this was one of the regular activities organized by the Mediateca in the ENALLT (National School of Languages, Linguistics and Translation). The main objective of this collaboration was to explore the potential of both institutions in different countries to make a direct and more vivid experience of communication between language students. It was also an opportunity to consider social problems in each country, practicing the language of study through conversation sessions between Japanese and Mexican students. We also expected that in this interaction students would be able to synthesize basic knowledge of their own country by responding to the expectations of communication with their partners. 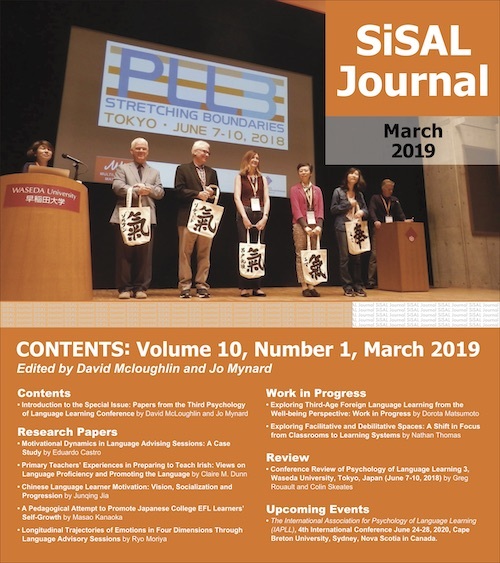 This paper aims to share the results noted from this collaborative learning experience based specially on self-evaluation of Mexican students, Japanese students’ learning logs and their final presentations. Silvia González is a Mexican journalist and scholar specializing in Communication. She obtained a PhD in Japanese Studies from El Colegio de México. She is the author of books on issues related to peace, human rights and communication. She has taught at different Mexican universities and is currently a Professor at Kanda University of International Studies (KUIS) in Japan. Kazuko Nagao is an Associate professor at the National Autonomous University of Mexico (UNAM). She is a learning language adviser at the SALC (Mediateca) at the National School of Languages, Linguistics and Translation (ENALLT). She obtained a Master’s degree in Applied Linguistics and is a PhD candidate in Linguistics at UNAM. 青木 直子, 栄 苗苗, 郭 菲, 劉 姝, 王 静斎, ＆ 丁 愛美. (2017).「対面式タンデム学習における学び：日本語学習者と日本語話者のやりとりにおけるLREを手がかりに」 [Language learning in face-to-face tandem learning: Looking at LREs in an interaction between a Japanese language learner and her Japanese-speaking partner] 『阪大日本語研究』, 29, 19-41. 池田 玲子 & 舘岡 洋子. (2007). 『ピアラーニング入門 – 創造的な学びのデザインのために』 [Introduction to peer-learning: Designing creative learning opportunities.] ひつじ書房. Little, D., & Brammerts, H. (1996). A guide to language learning in tandem via the internet. Dublin, Ireland: Trinity College, Center for Language and Communication Studies. 牧野 成一, 鎌田 修,山内 博之,斉藤 真理子,荻原 稚佳子, 伊藤 とく美, ＆ 中島 和子. (2001). 『ACTFL-OPI 入門 ― 日本語学習者の「話す力」を客観的に測る』 [Introduction to ACTFL-OPI: How to assess learners’ speaking skills of Japanese language objectively] アルク. O’Donnell, A. M., & A. King (Eds.). (1999). Cognitive perspectives on peer learning. Mahwah, NJ: Erlbaum. Ojanguren, S. A. (2006). El aprendizaje autónomo de lenguas en tándem. Principios, estrategias y experiencias de integración [Autonomous language learning through tándem: Principles, strategies and integration experiences] Asturias, Spain: Ediciones Universidad de Oviedo. 脇坂 真彩子. (2012). 「対面式タンデム学習の互恵性が学習者オートノミーを 高めるプロセス : 日本語学習者と英語学習者のケー ス・スタディ」[The process of how reciprocity promotes learner autonomy : A case study of a Japanese-English tandem pair].『阪大日本語研究』, 24, 75-102. 脇坂真彩子. (2013). 「Eタンデムにおいてドイツ人日本語学習者の動機を変化させた要因」 [Factors that influenced the motivation of a German learner of Japanese in eTandem] 『阪大日本語研究』, 25, 105-135.